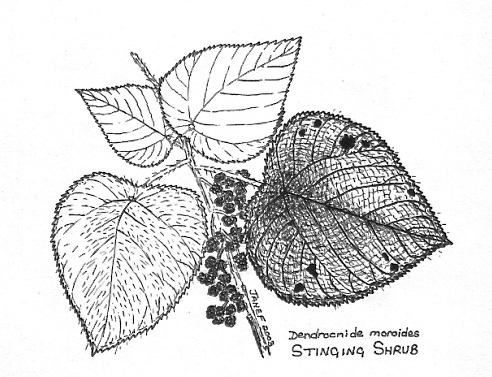 The first plant profile for this changing display will be the Stinging Tree, Dendrocnide moroides. This plant needs to be carefully identified because it causes severe and lasting pain when it comes into contact with the skin. The information below comes from John Beasley's book 'Plants of Tropical North Queensland - The Compact Guide'. While the forests of North Queensland are generally safe to explore, the Stinging Tree (Dendrocnide moroides) can inflict severe pain, and should be avoided. The fine silica hairs on leaves and stems act like small syringes, and continue to inject venom for several days, causing stabbing pain for weeks or months. Sudden cooling of the site, even several months later, can produce a tingling sensation. The immediate pain is severe, and can cause swelling of the lymph glands. Rubbing the site makes things worse, leaving the points of the broken-off hairs embedded in the skin. There was no effective treatment for the pain until . Applying ‘plastic skin’ and then pulling it off does remove some of the hairs; Aboriginal people used the sticky sap from the roots to do this. 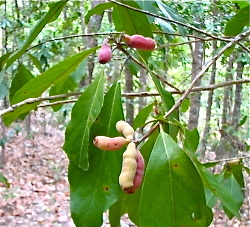 Dendrocnide moroides (above & right) is a shrub or small tree that grows in areas in rainforest where extra light can penetrate. This means it is often found on roadsides and in clearings, or where a tree has fallen. The large leaves are heart shaped, and covered with fine stinging hairs. The edges are serrated, as though cut with pinking shears. 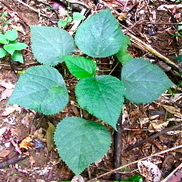 The leaves sit horizontally (Right) on long stalks which may be pink or reddish in colour and are attached towards the centre of the leaf. The raspberry-like fruits hang in clusters on the stem (right). They make a pleasant jam - if you are brave enough to pick and prepare them, removing all the hairy stems. It is a good precaution to learn to identify stinging trees if you are going to spend time in the rainforest. They are common on tracks in some areas. They can be confused with other trees and shrubs with heart shaped leaves, such as the Bleeding Heart (Omalanthus nova-guinsis) which has shiny leaves, some of which turn bright orange or scarlet red, and the introduced raspberry, a scrambling weed with somewhat similar leaves but a very different growth habit, that also infests rainforest margins. There are four species of Stinging Tree, found in rainforest from northern NSW to Iron Range in Cape York, extending north to Malaysia. It might be confused with Wild Raspberry, a thorny vine with lobed leaves, or Bleeding Heart, a tree with shiny heart shaped leaves. Look out for the large, hairy, heart-shaped leaves, with serrated edges, and avoid this dangerous plant. Many of the fruits of the rainforest are colourful and may be tempting to taste. Although many of them are eaten by birds and animals, this does not mean they are safe for us to eat. In fact, fruits eaten by some birds can be fatal to us. Never risk eating rainforest fruits unless you are confident of their identity and edibility. An edible fruit may closely resemble another fruit that is extremely poisonous – a mistake could cost your life. This fruit (right) can usually be eaten without ill effect. Yet, on occasion, it can produce permanent blindness. There is some debate over whether it is the fruit itself that causes the blindness or a mould on the fruit or something else. Whatever the reason, this is a fruit to avoid. It grows in rainforest in the Kuranda area. 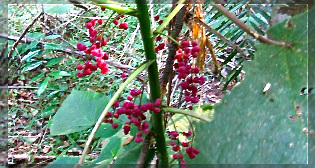 Many native fruits in North Queensland are poisonous. Do not risk eating or even tasting them, as even small amounts can be dangerous.